Why is 3D Web GIS starting to catch on? 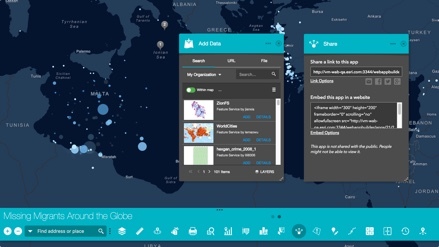 Access Web AppBuilder from the map viewer, Gallery, or My Content. Open the map viewer, click Share and click Make a Web Mapping Application. Click Web AppBuilder. You can also start from the Esri Featured Content > Apps section of the Gallery and choose App Builders. From My Content > Create> Apps, choose Using the Web AppBuilder. Configure the look-and-feel of the app by picking a theme. A theme includes a collection of panels, styles, layouts, and pre-configured widgets. 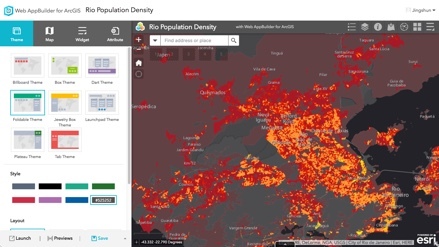 Select a map you've created with the map viewer or choose one from your own organization. If you open the Web AppBuilder from the map viewer, you will already have a map selected but you can change it. Widgets give your app functionality, such as print and overview map. Each theme has its own preconfigured set of widgets and you can add additional ones. Attributes allow you to customize your app banner with a logo, title, hyperlinks and so on. Preview the responsive app with popular device screen sizes. When ready, save and launch. 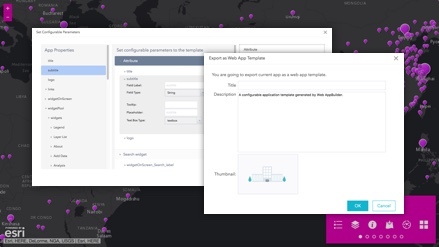 Create applications with a simple configuration builder experience. Create configurable application templates that are added to your organization application gallery. You can download and host the app on your web server. Further, you can extend the app by adding custom widgets and themes.